December 19, 2016 – Although there are no seasons in space, this cosmic vista invokes thoughts of a frosty winter landscape. It is, in fact, a region called NGC 6357 where radiation from hot, young stars is energizing the cooler gas in the cloud that surrounds them. This composite image contains X-ray data from NASA’s Chandra X-ray Observatory and the ROSAT telescope (purple), infrared data from NASA’s Spitzer Space Telescope (orange), and optical data from the SuperCosmos Sky Survey (blue) made by the United Kingdom Infrared Telescope. Located in our galaxy about 5,500 light years from Earth, NGC 6357 is actually a “cluster of clusters,” containing at least three clusters of young stars, including many hot, massive, luminous stars. The X-rays from Chandra and ROSAT reveal hundreds of point sources, which are the young stars in NGC 6357, as well as diffuse X-ray emission from hot gas. There are bubbles, or cavities, that have been created by radiation and material blowing away from the surfaces of massive stars, plus supernova explosions. Astronomers call NGC 6357 and other objects like it “HII” (pronounced “H-two”) regions. An HII region is created when the radiation from hot, young stars strips away the electrons from neutral hydrogen atoms in the surrounding gas to form clouds of ionized hydrogen, which is denoted scientifically as “HII”. 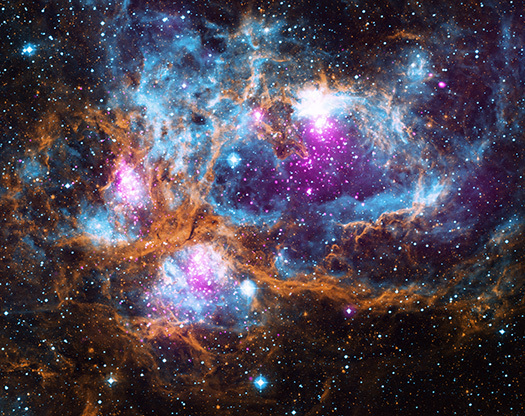 Researchers use Chandra to study NGC 6357 and similar objects because young stars are bright in X-rays. Also, X-rays can penetrate the shrouds of gas and dust surrounding these infant stars, allowing astronomers to see details of star birth that would be otherwise missed. A recent paper on Chandra observations of NGC 6357 by Leisa Townsley of Pennsylvania State University appeared in The Astrophysical Journal Supplement Series.